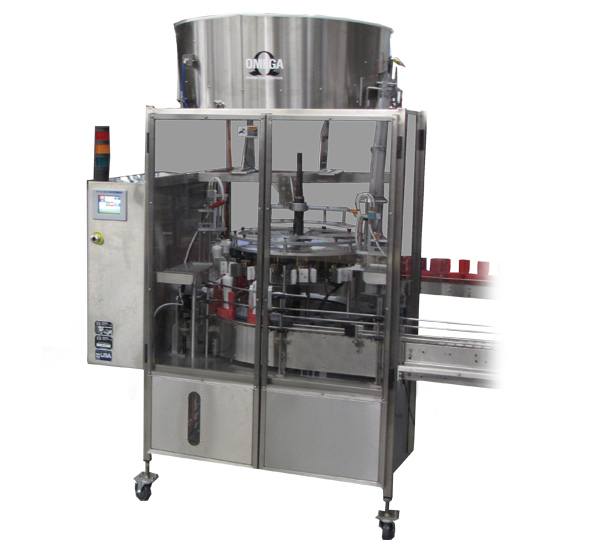 Omega's high speed Bottle Unscrambler (Descrambler) can handle, orient, and process empty or filled bottles for a wide range of applications, especially in the pharmaceutical, neutraceutical and consumer health industries. Rotary Pockets are Omega's patented gripper technology used to mechanically control the orientation and processing of bottles as they transition onto a moving conveyor. The model LCX is Omega's base model Rotary Pocket Bottle Unscrambler. This highly reliable, multifunctional packaging machine is a great choice for low speed, low volume operations as well as the most challenging, high-speed packaging lines. The LCX is a value-packed Unscrambler that can be configured to meet most packaging needs. The system is ideally suited for Nutraceutical and Personal Care Product manufacturers as well as emerging companies. This servo-controlled container handling machine relies on absolute positioning to dispense canister desiccants (or oxygen absorbers) into unscrambled bottles. Omega offers a variety of dispensing options depending on the machine speed, desiccant size, bottle opening, and desired tolerances. In addition, Omega can help you choose the optimal canister storage and delivery system based on your requirements and floor space. An integrated desiccant feeder is a great alternative to buying and shoehorning additional standalone canister feeders into your packaging line. Omega partners with many camera, printer and data management companies to integrate print and vision capability into its bottle unscrambling, orienting and packaging machines. Omega has significant experience with Continuous Inkjet (CIJ), Thermal Inkjet (TIJ), Laser, and UV printing on the tops, bottoms and sides of containers. Plus, the SRP Bottle Unscrambler can provide added security with an integrated reject system to ensure that only acceptable bottles exit the machine. Be sure to visit UnitLevel.com, Omega's brand protection division, for a closer look at Omega's SRP Intelli-Sort, which is designed to print and verify 2D data matrices, or other codes, for serialization and aggregation applications. Some bottle shapes are too small, thin, asymmetrical or irregular to stand upright on a fast-moving conveyor. The model PRP Unscrambler, also referred to as a Pucker, can place these bottles into custom-designed stabilizing pucks, which help support the bottles as they travel along a packaging line. Be sure to ask Omega about its Puck Design and Fabrication services. Typically, bottles get removed from their stabilizing pucks near the end of the line, once the product has been filled and capped. Omega's Depuckers use the same, reliable rotary pocket technology to gently lift and separate a bottle from its puck. The rotary pockets have minimal point-to-point contact with the bottles, which ensures positive handling and protection for pre-labeled and pre-printed bottle finishes. The Depucker also serves as an Orienter, whereby it can orient a bottle 180 degrees after removal from the puck. This feature is commonly used for tottle-style bottles. The machine is equipped with an infeed conveyor with a helix screw to provide timing into the rotary pockets and to control line pressures.